Formignano mining site is part of the 2nd biggest sulphur deposit in Italy (after Sicily), located today across the boundary between two regions, Romagna and Marche. The sulphur mining activity in the area has been going on since Roman time until the 20th century and involved several mines now in two different regions and several borough boundaries. Formignano mine is the best preserved one in Romagna, as it was the last one to be closed down in the region. Since antiquity sulphur, known as brimstone, “the stone that burns”, has been used in small quantities for a variety of purposes: colorant, bleaching agent for fabrics, incense in religious rites, insecticide in agriculture, ingredient of medicines and healing remedies, part of gum mastic to glue. The Romans in particular used it in combination with other substances in incendiary weapons and fireworks, as it happened in China and India. In Romagna the first few evidences of sulphur activity refer back indeed to Roman time and are constituted by place-names clearly linked with sulphur. It was presumably a small scale activity. In the 14th century the demand of sulphur in Europe increased rapidly as essential component of gunpowder, imported from Eastern Asia and used widely for war and civil uses. Several sulphur pits were worked out and gunpowder mills appeared near the mines. Written evidences of this activity in Romagna became more consistent from the 15-16th century onwards: among all a Papal Bull stating the State’s ownership on the underground and defining the conditions of a mine’s activity. Documents don’t give a comprehensive overview of the activity, but it is evident from them that mining and refining activity took place in several localities and was established as a productive economic source of the area. The first detailed account of the activity in the area is dated 1676 by science scholar L.F. Marsili who recorded his visit in Romagna, listing and locating all the active mines and giving a description of the pits and of the method to extract sulphur from its ore through “olle”, fire-resistant terracotta vessels. In 1759 the local writer Vincenzo Masini published a poem called Il zolfo, in which methods of extraction, locations of pits and production were described in verses and long explanatory footnotes – as it was usual in the 18th century Italian literature- with the help of detailed drawings. Notwithstanding what it seems a huge activity, important legislation appears only in 1796. From this date the license to mine has to be requested to the Prefect of the Province of Forlì. Through its archive it is thus possible to follow the development of the activity in the area. At the end of the 18th century sulphur started to be employed to make sulphuric acid, one of the most important base chemicals of the ‘chemical revolution’, being required in ever-increasing quantities. Indeed its rate of consumption may be regarded as one of the measures of the commercial and industrial prosperity of a nation (Leblanc soda process and bleach making depended on it, as did many numerous subsequent developments; in the 2nd half of the 19th century it was largely employed against a common disease in agriculture.). Its production boomed accordingly to the increasing importance of chemical products in society. Besides the chemical industry, the frequent wars in Europe in this century (Italy in particular was in the process of political unification) demanded constant supply of sulphur for weapons. The sulphur production took over in Italy from the middle of the 19th century and Italy played a leading role in the world production: Sicily accounted for the 75% of world production and Romagna – Marche area for the 5%, being thus the 1st and 2nd world producers. Exportation was directed to European countries as France, United Kingdom, Germany and United States. The activity boomed in Romagna-Marche and impacted the local economy, mainly based on agriculture: at the beginning of the 19th century there were approx 135 sulphur pits in the whole area. The high demand of sulphur attracted many entrepreneurs and, in Sicily and Romagna as well, the sulphur industry was seen as the new industry to invest in: a real ‘sulphur rush’ that moved initially local landowners, then, due to the high amount of money required, joint stock companies often with foreign investors, initially from France and, after 1870, from the United Kingdom. Nevertheless, the constant ups and downs of sulphur prices on the market led to a succession of periods of optimistic overproduction and sudden dismissal of mines that were flourishing the previous year. Moreover, the mine companies were characterized by difficulties and bad management that led many of them to close down and to some financially disastrous ends. in Sicily transport costs by sea were much lower than in Romagna, where the lack of communication’s infrastructures influenced the selling price. Romagna producers decided therefore to invest in the quality of the product and to export it refined, to attract new markets and to be able to compete with Sicilian sulphur. While Italy was under the process of political unification, in 1865, the first national body (‘Consiglio e Corpo Reale delle Miniere’) was created to control the mining industry and with the aim of giving a unique legislative framework to the newly unified country where a huge variety of local regulations and rules remained as remnants of the previous different political reigns. Local offices to control the activity and new schools to educate skilled technicians were set up (as with investors, technical staff working in the mines came initially from France and UK). Sulphur industry was one of the main economic asset of the new state and it needed an adequate attention. Several rules remained active and had different impact on the mining industry in Sicily and Romagna. According to the principle informing the legislation in Romagna since 1500, the landowner has legal rights on the surface ground, while the underground is property of the State, who has the right to license its use. In contrast to what happened in Sicily, in Romagna this legislation favoured the concentration of capital and mining sites and the establishment of big companies capable of keeping updated with the modernization of working techniques and methods. A unique legislation, adopting this principle on the entire national territory, was actually achieved only in 1927. In 1870, the majority of Romagna mines was indeed in the hands of two main groups: the ‘Società anonima delle miniere di zolfo di Romagna’, and the ‘Natale Dell’Amore & C.’ firm. Another important firm was the ‘Cesena Sulphur Company ltd’, with headquarters in London. Along with the increasing demand of sulphur by the chemical industry, many countries tried to step up their national production, researching new sulphur veins and cheaper working techniques. World-wide competition was difficult to keep up with for Italy and the Italian sulphur mining industry underwent several critical periods as in the beginning of the 20th century, when the employment of Frasch process, a newly completed and more economical technique of extracting sulphur, led to an irreversible shift in the world market. Frasch process was suitable to large consistent sulphur basins as in Texas and Louisiana, that could dispose also of huge quantity of water and low-cost fuel. In 1912 the United States became the first world suppliers with 788.000 tons, exceeding for the first time the Italian supply. The quality of the product and the need of less workers in the Frasch process made possible to lower the sulphur price, thus making quite difficult for the Italian suppliers to keep up. In 1917 during the I World War, one of the main Italian chemical enterprise, Montecatini, decided to devote itself to sulphur, whose demand was increased by the war, and acquired all the Romagna- Marche mines; in a few years Montecatini closed down all of them but for two, Perticara and Formignano. The American sulphur would have meant in the long run the end of the Italian sulphur industry, but between the World Wars the sulphur industry was among those favoured by the protection policy operated by the Fascist government. In Romagna the years 1938-1940 had indeed an average production between 122.000 and 111.000 tons of sulphur. They accounted for the 30% of national production, the maximum ever realized. After the II World War, the free competition with the American market was unsustainable for the Italian producers. The major mines stayed open as long as 1980 in Sicily and until 1962-64 in Romagna, but with variable results. Technology development in sulphur extraction enabled new sulphur deposits to be worked and new sources for its production. Today the history of sulphur continues in other countries: United States, Canada, Japan, France, Poland, Norway, South America, Indonesia and Philippines. Since the 16th century, sulphur had already its established ‘routes’ in Romagna: from the mines on the hills it was transported by cart on paths and small roads to the valley bottom, where the Savio river and a main road connected the valley towns to Cesena, the main centre in the area. From Cesena it was possible to transport the sulphur lumps by road and, after 1860, by train. The near harbour of Cesenatico was the main destination: from here sulphur was taken on small boats to the harbour in Ancona, one of the most important at that time in Italy, then on bigger vessels towards Spain and Fiandre. During the intense activity of the 19th century specific infrastructures were needed to favour the transport in the area. The transport costs couldn’t compete with the more favourable costs in Sicily and affected continuously the price of Romagna sulphur. It was thus a major concern for the mine companies attempting constantly to improve the communications of the area. In 1871 a quite unique horse-driven railway was built in ‘Boratella III’ mine: it was 4.5 km long and linked the mine to the main road down the valley. The railway was then dismantled at the end of the century when the mine closed: tracks and wagons were reused in other mines. Other projects were made and never completed: among all, a proper railway network that would have connected the valley to Cesena and Arezzo on the other side of Pennines. In the 20th century the transport from Formignano, the only working mine after the II World War, was made by trucks. The sulphur activity (comprising the mining and refining works as well as the subsidiary industries: transport and raw materials suppliers, as wood, bricks, iron, terracotta vessels….) with its industrial way of production had a deep impact on the area and its agriculture-based economy of the 19th century. Agriculture was undergoing a critical moment, even though it remained the main activity of the area until the 20th century, alongside the often temporary work in the mine. The sulphur activity changed the landscape (buildings, chimneys, excavation, exhaust gases effecting the vegetation, the slag heaps and the communication infrastructures) and most of all the social texture of the area. Mine workers were mainly farmers attracted by the possibility of a work. They went from the typical open-air work setting based on seasons into tight long work shifts (8-12 hours) in a unwelcoming working place, with a new severe hierarchy to fit into. They had to learn completely new skills quickly, leaving aside the traditional farmer’s work taught by their father since childhood. Working conditions were poor, due to the frequency of collapses and fires in the mine tunnels. The sulphuric anhydride, a result of the melting process, polluted heavily the air and burnt up all the surrounding vegetation. Lung diseases were common among the miners. The mortality was high and the average life duration was 30 years. There were attempts to improve the working conditions. Associations for worker’s assistance slowly took ground helping the miners in need: these were the first steps for the creation of cooperative societies, for which this region would have had a relevant history in the 20th century. Also, many small circles inspired by new political ideas of an equal society and human rights started to spread even if under the severe control of the authorities. Nevertheless, improvements were rare and achieved with big difficulties, as protests and strikes were always silenced by police and authorities. A previously unknown social mobility was taking place: the possibility of work attracted workers from the nearby hills and from other regions, moving with wife and children to live in small cabins near the mine: they changed the traditional patriarchal enlarged family and community with tight links for a new job in a community of strangers. The ‘ modern times family’ was breaking through rapidly and abruptly. Families used to live in small cabins near the mine, in an environment so highly polluted by the sulphuric anhydride that the vegetation was all burnt up and it was very difficult to grow any vegetable to enrich the poor dietary regime. The basic food (meat, milk, oil, lard, wine, salt, etc.) could be bought at a small shop built close to the mine, named ‘bettolino’ (or ‘botteghino’), usually owned by the mining company. The management of these small shops was without much control on prices and the quality of the food was not taken care of with the result of causing many severe diseases. The payment was done through a ‘truck system’, a system of notches on a stick corresponding to an amount of money to be deduced on wage’s day. While apparently useful for the miners, this system favoured the company. This type of shops were often the only gathering points, thus the set for fights and arguments that easily degenerated. For all these reasons, it is easily understandable why so often conflicts took the way of personal fights among miners, the only way of expressing their anger, of which some relevant evidence is to be found at the Province Law Court’s Archive. Sulphur is to be found in sedimentary layers, as by-product of volcanic eruptions, in sulphuric waters and in fossil combustible material. In Romagna sulphur is a deposit originated by the evaporation of sea-water in Tertiary era (Miocene) when Mediterranean sea was temporarily isolated as a lake. Romagna sulphur veins are scattered, thin and lie mostly between deposits of bitumen clay, a very fragile mineral that needed to be excavated carefully and removed in the process of sulphur mining. As other minerals, initially sulphur was easily found in surface outcrops: pure in small quantity near volcanoes and more often in combination with other elements, sulphides and sulphates, to be refined through heating. Quite soon it had to be mined (Roman times). Today, sulphur is also obtained by industrial wastes and by-products and extracted from ‘sour’ natural gas. After being excavated, the sulphur ore had to be cut into smaller pieces in order to be refined, i.e. separated from the rest of the stone. The sulphur ore was excavated by pick and later by explosive mines. The ore was then carried along the tunnels to the main shaft, loaded in wheel-barrows and later in wagons pulled on wooden or iron tracks by human or animal force. The ore was loaded in the elevator or in the wagon until the exit and taken to the melting area. The melting process was basically constituted of heating the stone and separating it from other elements, the sulphur melting at a relatively low temperature (112°-114° Celsius). The increase in the demand of sulphur prompted the research of methods more effective and economically viable all based on this basic principle, except the Frasch process. A subsequent refining process may take place in refineries to prepare a product suitable for different commercial uses. The main differences among the various techniques were the burning material used (sulphur as self burning material or wood, coal, hot water and steam), chemical or mechanical devices being a minority; the possibility of monitoring and controlling the combustion so as to avoid to burn out the sulphur instead of melting it; the efficiency of the heating process, exp. due to the reuse of the combustion heat and the amount of sulphuric anhydride that was a main pollution concern as all vegetation of any type disappeared in the proximity of a sulphur melting area. Here below a description of the furnaces used for the treatment of the sulphur ore. The description of the Frasch process. Doppioni: system of two terra-cotta vessels (olle or pignatte), connected with a pipe. One of the vessels is heated on fire (wood or coke later) and charged with small sulphur stones. The evaporated sulphur (approx 410° Celsius) passes through the pipe, cools down in the other vessel and pours out into wooden moulds, while the slag is unloaded from the first one. The name ‘doppioni’ (double) applies also to groups of 4, 6, 8 vessels. Later on vessels have been produced in cast iron (called storte, pignatte or pentole). The refining process is here based on distillation, not on melting as in the other processes. In Italy the system was used exclusively in Romagna, but it must have been known in other countries as well, shape and size of the vessels varying. Calcarella (carcara in Romagna): a fire-brick lined round open-topped furnace (1,5- 2 meters diameter) with an inclined bottom covered with slag, where the sulphur mineral is charged in a cone-shaped uncovered pile and burnt from the top. The molten sulphur pours out from a bottom tap hole directly into small moulds. It is a highly consuming and polluting furnace: it is not possible to control the combustion; climatic factors may speed up or slow the process and even destroy the product; all the resultant sulphuric anhydride spreads into the air, with damages to the surrounding landscape (it was compulsory by law that this type of furnace couldn’t be built less than three km from a town). Yield: 1/3 of the employed sulphur. Average duration: 2 days depending on weather conditions. 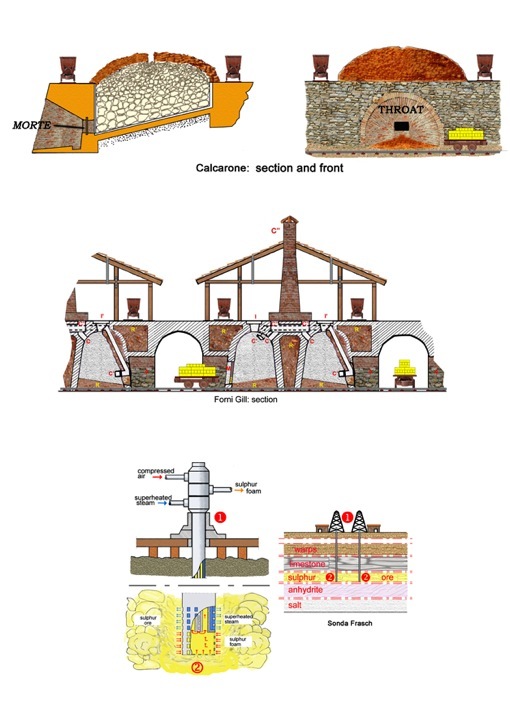 Calcaroni: fire-brick lined round furnace (5-20 meters diameter) very similar to calcarella furnace in layout and working, but more successful. The main difference is the cover of soil or slag (rosticci or bruciaticce) put on the cone-shaped pile of sulphur ore (2-5 m height), enabling to control the combustion, to protect from climatic variations and to reduce sensibly the environmental pollution by exhaust gases, that was in any case still considerable. Due to its bigger size, the charging and unloading were time-consuming processes. Molten sulphur is drawn from a tap hole, opened in the throat of the calcarone (named ‘morte’, i.e. ‘death’) at the proper time. Since 1850 it has been the most widely employed furnace. Yield: 50-65% of the employed sulphur. Average duration: 30-90 days depending on the size (250 mc to 2500 mc). Forni Gill: continuous furnace with a series of cone-shaped chambers connected sequentially, the heat from the first chamber being used to preheat and to set fire to the second one and so on. Each chamber has an inclined floor covered with slag and is provided with several openings: for charging (I-I’), for the pipe conveying the heat (C’) and for the combustion gases exhausted then through a main chimney (C-C’’). At the bottom, a tap hole (M -‘morte’) for molten sulphur and another adjustable one for the air needed for the combustion. The openings are controlled and opened at precise times. Its reduced size, enables also small quantities of sulphur to be worked. It is highly effective in reducing the quantity of exhaust gases spread in the air. Installation costs are high. It has been licensed in 1880 (named after its inventor eng. Gill) and has been widely employed in Sicily, less in Romagna, where calcaroni remained in favour until the last years of the industry. Frasch process: an in-situ melting process for extracting sulphur. In this process, a hole is drilled into the sulphur formation and cased. Then, a tube with three concentric pipes is placed within the protective casing. Superheated steam is passed down the outer pipe to melt the sulphur, which is then forced up through the intermediate pipe by compressed air from the inner tube. The steam in the outer casing keeps the sulphur molten in the pipe. Only a part of the sulphur is extracted from the sulphur bed, but the product is pure. Conceived in 1894 by Herman Frasch, it became widely applied in the early years of 20th century. It is exploitable only with large deposits of porous sulphur between waterproof stone formations. It enabled the extraction in formations that it was not possible to mine, due to their geological layout. It saves the cost of mining the rocks, needs less workers and avoids above-ground waste piles. A big system of steamers is needed with high need of fuel and high quantity of water. It has never been tempted in Italy, not even in those suitable veins, because of the lack of water and low cost fuel. It is important to underline that the introduction of new type of furnaces didn’t imply the dismissal of the old ones: small mining sites usually couldn’t afford the technical upgrade at all. The most widely employed fuel in Sicily was mainly sulphur used as a burning material due to the abundance of it, while in Romagna other burning material were in use. This leads to a peculiarity of both techniques as specific to certain areas. The mining site lies 1 km far from Formignano, a small village in the surrounding of Borello town in the borough of Cesena. The vein was 2 km long and 4-500 metres deep and belongs to a formation that is 15-20 km long and 1 km wide. Under the common name of Formignano, lies two mines and research fields: ‘Busca-Montemauro’ and ‘Luzzena-Formignano’ separated originally but communicating at a later stage through the expansion of underground tunnels and through a cableway connection. The first testified excavation took place in 1556. The exploitation of this deposit was extended in the 19th century during which the average production passed from few dozens to 7.000 tons per year. In the 19th century the mine had several managements: from 1801 the local entrepreneur Natale Dellamore, in 1823 the local aristocrat count Cisterni, together with French entrepreneurs in 1838. In 1843 the ‘Nuova Societa’ delle Miniere Zolfuree di Romagna’ was established in Bologna to manage the mine and in 1855, as new financial investment was needed, the society underwent transformation becoming a joint-stock company, (‘Societa’ anonima delle Miniere Solfuree di Romagna’), one of the first established in the world. The company managed the mines of Perticara e Formignano and others until 1896, when it was winded up. The amount of money needed to keep up with technical improvement in order to be competitive with Sicilian sulphur lead to huge investments and often to financial failures. After an attempt of a cooperative management by a group of employees and miners, in 1899 the mine was sold to a new society, ‘Societa’ Anonima Miniere Solfuree Trezza-Albani di Romagna’: at the beginning of the century there were in operation 44 Gill furnaces, very important for a modern activity, 3 ‘calcheroni’ furnaces and one ‘doppione’. In 1917 Montecatini company acquired all the mines in the area, closing in few years all but two, Formignano and Perticara, and invested in the improvement of the machinery and the buildings. In a Montecatini’s report difficulties of extracting the mineral were listed: the veins were thin, maximum 2 m wide and randomly located in depth, thus obliging the expensive excavation of long tunnels and deep shafts. Apart from temporary closing in 1923 and, during II WW, in 1945-46, the mine worked as long as 1962 when it closed down: the sulphur vein was not exhausted, but it was not financially profitable to keep the mine in activity anymore. In 1962 there were 21 mine levels of excavation reaching a depth of 500 m and extending for 3 km, with 9 inclined shafts (comprising the main one, 560 m long and reaching the 11th level). The total production of the mine from 1861 to 1962 was 409.000 tons (the peak in 1912 with 8344 tons) and the average employment 250 miners (the maximum in 1910 with 441 miners). The mining village is located to the south of the Formignano town. The village is on a 20 hectares field and comprehends buildings with a functional characterization (for mining activity and residential for mines employees) and melting plants: this made the entire village a complete production entity. The main group of buildings are lined along two parallel paths: one on a upper level on which residential buildings are mostly grouped, the other on a lower level where offices and workshops are lined, with a water pool in the middle. The two paths join together at both ends and are linked in the middle (near the water pool) by a brick-made staircase. A path leads to the melting area and to the slag heaps that overlook the valley. Other buildings are located far from the village: the Montecatini main office near the main gate, a farmer house in valley bottom and the S. Barbara chapel (patron of firemen and miners), near the actual car park (that used to be the tennis court built by Montecatini ). The architectural value of the buildings is not high, but the village with functional and residential buildings is a quite unique layout for a mining site in Italy. Moreover, the landscape visible today still bears the evidence of the mining activity ( slag accumulation, modification of contours and eco-habitat): it’s a landscape shaped both by nature and human beings and is essential part of the site. During the 80ies, a first awareness of the importance of recording the history of the mines arose. Oral memories, photographs and written documents started to be collected by people who then constituted the “Società di Ricerca e Studio della Romagna Mineraria”. In the 90ies the focus was on the development of the area as heritage site, the restoration of the buildings and the acquisition of machinery from others mines. 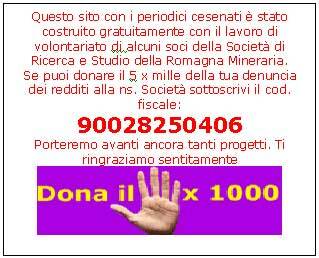 1986: creation of “Società di Ricerca e Studio della Romagna Mineraria”. 1988-89 – 1st project on the site (including site’s recording, planning for restoration of the building, development of the area as open air museum with leisure and commercial activities). Sustainable management is the idea informing the project. The main points of the project will inform all the following ones. 2003 – update of the 1st project (including update of the site’s recording; financial plan). It divides the project in 2 steps, the first with a smaller investment for the restoration of a portion of the buildings. Among the stockholders aristocrats and renowned people, like the soon to be Prime Minister Marco Minghetti and the opera composer Giacomo Rossini. This testifies the interest that sulphur activity roused in the upper class. Slaves’ use is testified in a Roman mine located in the area and called ‘Sulfaranaccia’; a later document of 1047 briefly mention another Roman colony established in the area, ‘San Pietro in Sulferina’, close to Formignano mine. The uncertain origin of the name of the river crossing the area, the river Savio, may also be traced back to the presence of sulphur in its water: from lat.’sapere’ i.d. ‘to be tasty’. In Sicily surface and underground are property of the landowner, who could decide to run the mine or rent it out. While this situation is suitable to the open market principles, it favours often the fragmentation of capital and mining sites, leading usually to under-budgeted small companies relaying on traditional uneconomic production methods. This principle is applied also in UK and other Mediterranean countries.